Practically all of my favorite gaming moments involve others. This is shown immensely by what games I purchase. For every single player game I own I probably own at least three or four others that are either designed around multiplayer, such as fighting games, or become a lot more fun with others, such as beat-em-ups. So when I found out that Pokemon Rumble combined two of my favorite nerdy things (Pokemon and cooperative gaming), I squealed like a little fangirl and gave Nintendo my 1500 Wii Points. Wednesdays are usually interesting to people with XBox Live. Today doesn't float my personal boat, however, outside of the name of the XBLA offering KrissX, pronounced "Kriss Cross" or "Kris Kross" for those who may have wanted to "jump jump" upon mention. If I were a younger boy (like 15 years younger) I'd probably be all over this, but I personally like my word games to involve me thinking of a word rather than just unscrambling them. To each their own, though, and 800 points grabs it if it grabs you. Also 800 points for this week is Portal: Still Alive. That's 5 bucks easier to get if you've been on the fence about it. See what all your friends are talking about when they mention the false reality of certain baked goods. If you say it to me, though, so help me I'll never invite you to my birthday party again. Seriously. You say "Monday", I say "Goofy Stuff On Wii Shop Channel Day". I also say "Go Play Fighting Games With Others Day" at night and "mrrrrghllhrrgl" when I get up. WiiWare throws us Uno for 1000 Wii Points. If you're still here after reading that, you either have it already in some other form or I didn't type it loud enough. There. Now that you have that downloaded and are back to this post, I can finish. The other two WiiWare offers are "Aha! I Found It!" Hidden Object Game for 500 Wii Points, where you can play Where's Waldo with a fish or 276 other objects, and bittos+ for 800 Points, a board game of sorts that involves placing squares within squares. Not sure what else you do, the blurb was kind of vague. The Virtual Console only has one offering this week with the SNES title Ghoul Patrol. 800 Wii Points gets you the sequel to the cult hit Zombies Ate My Neighbors. Speaking of WiiWare, that's the category for my review this week. And because I'm three years old I'm reviewing the Pokemon-based beat-'em-up Pokemon Rumble. Imagine Gauntlet with cute and the "gotta catch 'em all" OCD that makes Pokemon not recommended for anyone with heart conditions or impressionable minds. This week's review cost me some sanity and nearly a controller, something few games have done. The first one that did this since I was little was Ninja Gaiden on the original XBox roughly six years ago. Playing mostly competitive games, I don't get the opportunity to get frustrated with the game as much as I do with myself or my opponent. However, I've still encountered a few since then. Geometry Wars, Pilotwings, and a small handful of others have taxed my patience. Some of these I come back to and others I leave behind. The difference between the good games that do this and the bad ones is whether or not you think continuing on is worth the risk of chucking a controller and the frustration of retrying something hundreds of times. RedLynx's Trials HD definitely fits the description of a game with that risk and frustraion but, thankfully, rewards and entertains as much as it infuriates. New Monday equals new games for the Wii Shop Channel. WiiWare side we got Namco Bandai's Muscle March. You, uh, pose differently to get through different holes in walls, and you can be a panda in a bikini, or a dude in a two-piece...what is this I don't even. 500 points can buy you that what-the-effery. There's The Amazing Brain Train as well, giving you yet another option for Wii brain teasers at 600 points. The Virtual Console gets a Shinobi game I didn't know even existed with Shadow Dancer: The Secret of Shinobi. I doubt I'll throw 800 points at it, but I might at least look it up. I feel ashamed of my ignorance. XBox Live's Deal of the Week is Battleship for 400 points. ...someone had to write about it. Last but not least (that honor was given to Battleship), my review choice for this week. 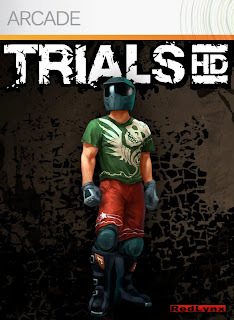 I've already reviewed a twin-stick shooter this month with Square Off so instead of reviewing Death By Cube, one of this week's XBLA games, I'll go with Trials HD. I wasn't completely sold on the demo but after hearing so many excellent reviews of the game and about how difficult it is I figure I'll give it a shot. If you hear a loud thud, though, that's my controller hitting the wall. At some point in time, though, I'll at least give my impressions of the demo of Death By Cube. Having played this game for many hours in my younger years but not touching the game since I was 17, I was curious how my view of a game aged 20 years would come out. A game that, in its time, used the revolutionary Mode 7 Engine for its 3D view but now looks dated and pixelated compared to even some of the simplest 3D games. A game with no multiplayer, no real story, and no replay value other than to top your old scores on each stage or try to achieve a few different and more difficult goals. My view, admittedly seen through a slightly rose-tinted lens, saw a game that made me feel a little younger and, finally, a credits and completion screen I'd never found in my teen years. This week's XBLA release is the HD re-release of Serious Sam: The First Encounter. I don't think there are too many FPS games these days that are so focused on old-school gratuitous shooting, so anyone who just wants to blow crap up should at least check the demo out. 1200 points buys you single-player, online only co-op, and a lot of bullets. Doesn't do anything for me, however, unless you count the massive headache and possible lunch tossing. Another Monday, another batch of Wii downloads available on the Wii Shop Channel. Virtual Console pickings are slim this week as the only release is Shanghai II: Dragon's Eye from the Sega Genesis for 800 points. If console mahjong solitaire is your thing, here's an option. WiiWare sees a port of the DS's Phoenix Wright: Ace Attorney for 1000 points. Well, the first four episodes from it anyway. Fifth one will be released later for 100 more points. 11 bucks definitely isn't bad for a great game and if you haven't played it on the DS then here's your chance to see why everyone shouts "OBJECTION!" at random times. Also on the menu is Chronos Twins DX (1000 points), a puzzle/platformer, and ShadowPlay (800 points), a puzzle/um...puzzler. XBox Live's Deal of the Week is the Magic: The Gathering game Duels of the Planeswalkers for 400 points. I personally say "worth it" but you might want to try out the demo first if you don't have it already. 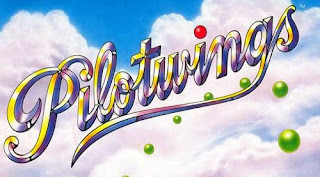 And, finally, this week's review will be of the Virtual Console's Pilotwings, originally on the SNES and one of my favorite games back in my teen years. Will my motion-sickness turn my rose-colored glasses green? Or will it hold up to a 10-year old memory of awesomeness? Find out Friday. Earlier this week I said my first review would be of the game Square Off. Not wanting to disappoint so early in my amateur blogging career, I've put countless (read: five) hours of gameplay and a steady supply of caffeine and cursing at the TV into what is my first review. Welcome to my gaming blog, "Digital Quarters". As the name implies, I'll be reviewing games that are usually only available via download on the 360's Indie Games and Live Arcade marketplaces or the Wii's WiiWare and Virtual Console shop channels. (Nothing against the PS3...I just don't have one.) Each week over the course of a month will focus on a different one of those four digital shops, starting with the 360's Indie Games, followed with the Wii's Virtual Console, the 360's Arcade, and finally WiiWare. I'll also throw in random reviews of 360 Indie Games that only cost a buck under the heading "Four Quarter Frenzy". 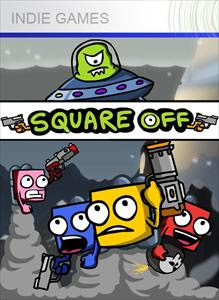 Up later this week is the 360 Indie Game "Square Off", a 2D twin-stick shooter with a look professional and cartoon-y enough to make you think of Behemoth's "Castle Crashers" or "Alien Hominid". Will it be more than just a pretty face? Find out later this week.